An industry first...for the "Fire Factory" in Harlem. This is the industry's first museum grade KME engine replica. Each individually designed, cast or fabricated part is hand-assembled using tweezers, glue-filled syringes, and a steady hand. Materials are chosen to replicate each feature accurately and include stainless steel, high-def resin, brass, wire, rubber and other composites. From the steel door hinges and cab steps, to the tiny bulb detail within each light, this 1:50 scale replica emulates Engine 58's Severe Service Pumper. Our goal with each release is that our customers may notice something new each time they view the model. 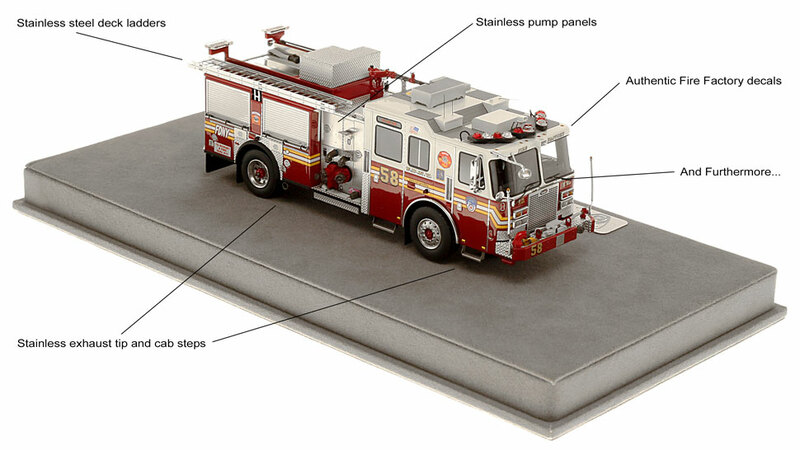 Engine 58 features impeccable detailing and true-to-scale parts that only stainless steel can provide. Fire Replicas has ushered in a new standard in 1:50 scale modeling that is sure to impress the most discriminating collectors. Only 140 units of Engine 58 have been produced. Fire Replicas are designed with the elite collector in mind, and manufactured in limited quantities to enhance long-term value. 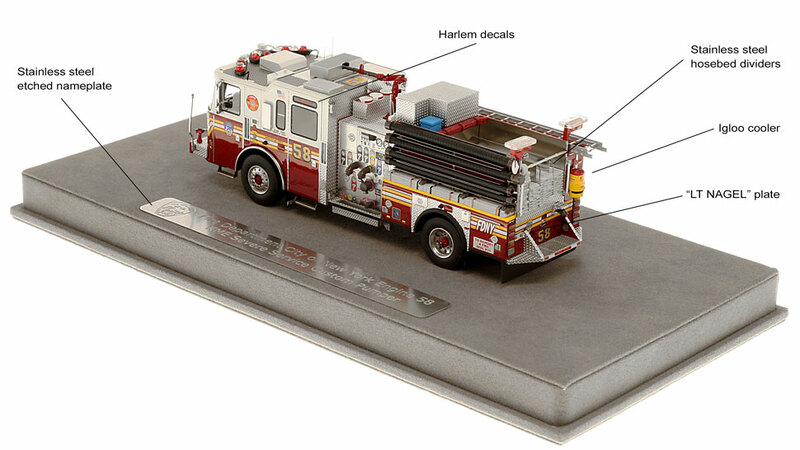 The FDNY Engine 58 measures 7.75"L x 2.5"W x 2.75"T and is securely displayed inside a custom case. 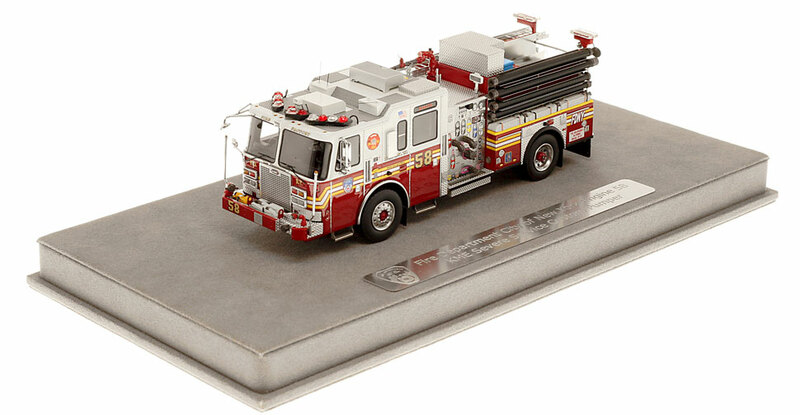 The case dimensions are 12"L x 6"W x 5.25"T and the platform includes an etched stainless steel nameplate with the FDNY seal, department and truck name. This FDNY Engine 58 scale model is a museum grade replica of the KME Severe Service Pumper. Like all Fire Replicas models, every detail is modeled to perfection and with razor sharp precision. The replica features the specific department configuration and graphics, leaving no detail overlooked. The display case is custom manufactured with high quality acrylic and resin. The stainless steel etched plate features the department and truck name, and department seal. This replica is a treasure to be displayed and admired and is in no way a toy. Another excellent model with amazing detail! So accurate......could almost smell the exhaust, hear the engine idling. The attention to finite detail is outstanding. Looking forward to future top quality releases. As with all Fire Replica models, attention to detail is superb. The detail on all of the graphics is second to none. Each model gets better as time goes on. Just when you think it couldn't get better, Fire Replicas again raises the bar on detail and accuracy. The new FDNY KME Severe Service pumpers are simply awesome. E58 is a perfect example of the attention to detail Fire Replicas has shown with these new KME models. Sure you get the usual Fire Replicas stuff: crisp casting, super-detailed with heavy use of photo-etch throughout. Plus perfect fit, finish and markings and you have a faithfully reproduced FDNY Engine. But no, you get more! E58 includes a super detailed pump panel, along with specific to E58 features such as the Igloo cooler, Fire Factory decals and more. Amazing in every way! Do not miss out on this model, there are only 140 available!